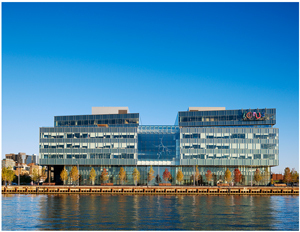 Corus Entertainment today announced the official opening of Corus Quay – the Company’s new Canadian headquarters built on Toronto’s waterfront. Corus Quay integrates advanced digital technologies and automated systems that transform Corus’ broadcast and content businesses making Corus Quay North America’s most advanced broadcast facility and Toronto’s smartest building, shown here in two photos by Richard Johnson. “With a fully integrated and 100% digital infrastructure, Corus is more prepared than anyone for a digital world because it can deliver content to distributors in any format for any platform with equal speed and efficiency,” said Marcos Gonzalez-Flower, Global Head, Media Consulting, Siemens IT Solutions and Services, Inc.
With Corus Quay, the Company has successfully consolidated its Toronto-based operations from 11 distinct locations, including 24 television services, three Toronto radio stations and over 1,100 employees into one facility. Not only does Corus Quay house all current operations, its efficient configuration allows for up to three times as many services to be delivered from the facility. In addition to enhancing Corus’ technical capabilities, Corus Quay offers an open concept office space that creates a collaborative and innovative work environment. The facility is also environmentally advanced and has targeted LEED(R) Gold Certification. 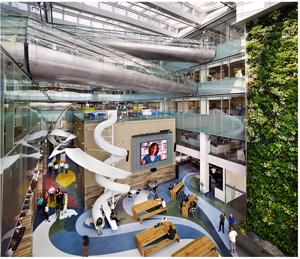 Corus Quay features a significantly reduced power signature, a five-storey bio wall for air filtration, a green roof and energy efficient lighting. Corus Quay uses low-flow water fixtures and re-used rainwater to reduce water consumption. To encourage employees to use non-carbon generating forms of transportation, Corus Quay provides an underground storage facility for more than 70 bicycles. Corus Quay was developed by Toronto Port Lands Company, formerly known as the City of Toronto Economic Development Corporation (TEDCO) and will be owned and managed by Build Toronto Inc. Designed by world-renowned architect Jack Diamond of Diamond and Schmitt Architects, with interiors by the award-winning firm Quadrangle Architects Limited, it is the anchor project in the revitalization of East Bayfront, bringing life, energy and business opportunities to Toronto’s waterfront. This entry was posted on Tuesday, September 28th, 2010 at 11:31 am and is filed under Business News, National News. You can follow any responses to this entry through the RSS 2.0 feed. You can leave a response, or trackback from your own site.